If I terminate an employee after a 90 day probationary period, do I still have to pay Unemployment Insurance? Most likely, yes. But, not immediately. And, possibly not ever. Contrary to popular belief, a probationary status has no bearing on whether an employer has to pay unemployment insurance. Whether an employer plans on having its employee work for a week, a month or long-term, the employer is required to pay unemployment insurance on that employee and may be liable for benefits that employee later draws if he or she becomes unemployed. Aside from a very few special exceptions, employers with one or more employees (part time or full time) are subject to unemployment insurance laws. Unemployment Insurance, also called unemployment compensation, unemployment tax or unemployment benefits is 100% employer funded through federal and state employer payroll taxes. The employer is required to fund an account based on a payroll tax formula. If an employer terminates an employee, the employee may be eligible for unemployment benefits, and those benefits would be paid through the funds of one or more of the employee’s previous employers. 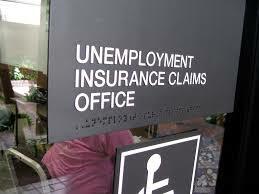 When does an employee qualify for Unemployment Insurance? Employees that were let go from employment, that earned sufficient wages in during their “base period” (the base period will be explained thoroughly in the next section) of employment will be eligible for unemployment insurance. However, employees terminated for misconduct are not eligible for unemployment insurance. For information on what constitutes misconduct, check out KEW’s article, “How badly does my employee have to mess up to be denied Unemployment Insurance?“. Also, employees that quit for good cause may still be eligible for unemployment insurance. Examples of good cause include a suggestion or request by the employer that the employee violate the law, or sexual harassment that the employer knew or should have known about but failed to take appropriate action. What is a base period and how is it used? Bobby worked at Spaceship Center from January 2014 to June 2016. Then, he started working Bottlerockets in July 2016 under a 90 day probationary period. By the end of his 90 day probationary period in October, Bottlerockets decided that Bobby was not working out and terminated him. Bobby filed for unemployment insurance in October 2016. To determine whether Bobby will receive Unemployment Insurance, and if he receives it, how much Bobby will receive, and who will pay Bobby, we first need to determine Bobby’s base period. To do this, we look to the fourth row in the illustration above because he filed his claim in October. We disregard the quarter in which he claimed unemployment insurance, in other words the 4th quarter of 2016, and then look at the previous five quarters. Those would be Quarters 1, 2, 3 of 2016, and Quarters 3 and 4 of 2015. 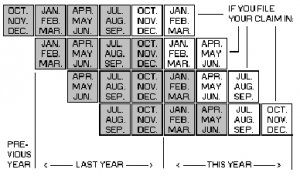 The base period is calculated based on the first four of those five quarters which would be Quarters 3 and 4 of 2015, and Quarters 1 and 2 of 2016. In other words, July 1, 2015 through June 30, 2016 is Bobby’s base period. Because Bobby worked only for Spaceship Center during his base period (July 1, 2015 through June 30, 2016), his unemployment benefit amount is dependent solely on the amount of wages he earned from Spaceship Center, and the benefit amount would come out of Spaceship Center’s fund, only. So, Bottlerockets is off the hook then, right? Suppose Bobby collects unemployment insurance from October 2016 through May 2017, and then accepts employment from Robobot in June 2017. He works at Robobot until he is terminated in August 2017. Bobby files for unemployment insurance in August 2017. To determine his weekly benefit rate, we would perform a similar analysis to the one for his first period of unemployment after his termination from Bottlerockets. As before, the first step involves calculating Bobby’s base period. Bobby files for unemployment insurance in Quarter 3 of 2017, and so we disregard that quarter, and look at the previous five quarters – Quarters 1 and 2 of 2017 and Quarters 2, 3, and 4 of 2016. Then, we take the first four of those quarters to determine Bobby’s base period for this bout of unemployment insurance – Quarter 2 of 2017, and Quarters 2, 3, and 4 of 2016. In other words, April 1, 2016 – March 31, 2017. Bobby’s unemployment insurance benefits are calculated based on all of his employment during his base period, so three months working for Bottlerockets and one month working for Robobot. The amount each company would pay out of its fund is determined by a pro-rata formula based on the amount of wages each employer paid during the base period. So, unlike the previous example, it is clear in this situation that Bottlerockets would end up having to pay unemployment insurance out of its fund, long after its termination of Bobby within his 90-day probation period. The weekly benefit amount an employee will earn is equal to 4% of the total wages earned in the quarter in which the claimant earned the most wages (“high quarter”). DWD imposes minimums and maximums on the benefit amounts. Currently, the minimum weekly benefit amount is $54, which would require an employee to earn at least $1,350 in the employee’s high quarter. The maximum weekly benefit rate is $370, which would require an employee to earn $9,250 in the employee’s high quarter. For help determining a weekly benefit rate, the DWD has a weekly benefit rate chart, available here. Additional information on Wisconsin Unemployment Insurance can be found here. Contact us at for a more detailed analysis of how unemployment insurance may affect your business. Attorneys Jessica M. Kramer, Leslie Elkins and Nicholas Watt are ready to assist you in proper planning to minimize the impact unemployment insurance claims may have on your business.